Venezuela has just taken the next step in its quest to “free” itself from the tyranny of US dollar hegemony. One year after the country said it would stop accepting US dollars as payment for its (ever shrinking) oil exports (saying the country’s state-run oil company would accept payment in yuan instead), Venezuelan Vice President for Economy Tareck El Aissami said Tuesday that Venezuela will officially purge the dollar from its exchange market in favor of euros. “If they pursue us with the dollar, we’ll use the Russian ruble, the yuan, yen, the Indian rupee, the euro,” Maduro declared. The sanctions have largely excluded Venezuela from international capital markets and the US dollar-based financial system, forcing Maduro’s regime to rely on money-for-oil loans extended by China. 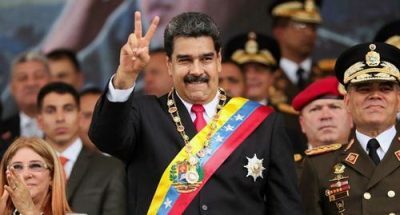 Even if it’s insignificant relative to Russia and China’s plans to create an alternative global financial system based on rubles and the yuan, this move is one more blow against US dollar hegemony, and one more step into the open arms of China, which has helped keep Maduro’s teetering regime afloat in the face of an assassination attempt and an aborted US-backed coup.